St. Joan of Arc PTO web page! information about PTO events, links to volunteer sign-ups, and much more! ​Who is involved in the PTO? free to contact any of the PTO board members if you have any thoughts, suggestions, or ideas pertaining to the PTO, and please visit our "Get Involved - Volunteer" page if you would like to join in the fun at one of our many events or activities! ​What exactly is the PTO? 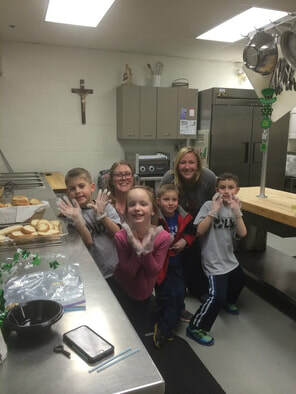 The purpose of the PTO is to provide a means for parents and teachers to cooperatively work together for the benefit of all students and St. Joan of Arc School. Our motto is "It's all for the students! ", and we truly try to keep that the focus of our organization and all that we do. The PTO coordinates many fun events throughout the year for students and families. Meetings are held once per month for planning and discussion of events and ideas, and are open to all parents at SJA! Our events would not be possible without the help of parent volunteers, and information about upcoming events and volunteer requests will be sent home through e-mails and flyers. Participating in these fun events is a great way to get to know other families and support our children and teachers!